¡Hola! Hello! My name is Pedro. I am a red-eyed tree frog from Peru. I used to live in the top of a tall tree on the edge of the Amazon rainforest. One day it was raining really hard and I fell out my tree into the banana plantation below. I was scared so I hid inside a big bunch of bananas. When the sun came out some men picked all the bananas and I started a very long journey. I came to England, the plane landed in Sussex and here I am. 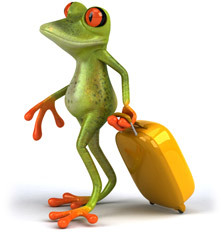 I do not look like English frogs, do I? I am the size of a tea cup – I know how you English like your cups of tea! Sussex is a very beautiful place with lots of things to do. I hear the people here are working hard to make Sussex greener. This makes me very happy. 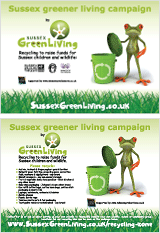 Will you help me make Sussex the greenest place on the planet to live? I hope you enjoy my website. Take a look around – add me to your Favourites so you can keep up with new ways to “green up” Sussex. Get lots of free ideas for green play and games. And let me know what you get up to – send me your photos and ideas to share with other Sussex families so they can learn and try them too. I look forward to hearing from you. ¡Hasta luego! See you soon!